Need something you don’t see here? We’re here to help! Contact Street Team Leader Paige at PaigeW@chicagomarket.coop with your request. If you’re going to tell our story, you’re going to get asked lots of questions. That’s great! But it’s nice to have the answers. If you have any questions that aren't covered, just ask a Chicago Market organizer - we’ll get you anything you need. • First, follow Chicago Market on Facebook and Twitter. We share news about the co-op and our #1000in100 campaign, as well as information on the co-op movement, sustainable food, and Chicago’s local-food movement. • Add Chicago Market flair to your profile. 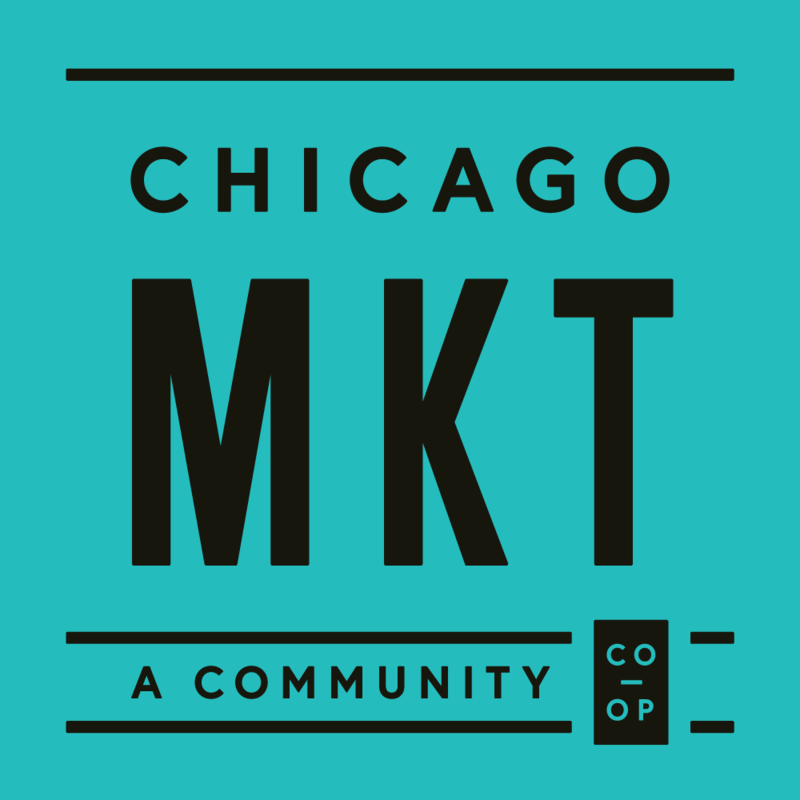 Share the Chicago Market badge as a photo on your social networks. Make it your profile picture. Add one of our custom banners as your cover image. These images were made to be shared! Tweak the language on this template (pdf) to send a personal appeal to your friends, family, coworkers or anyone you think should become part of the Market. Getting out into the community for one-on-one conversations about Chicago Market is one of the most-powerful things we can do. It’s what we call “tableing” — setting up shop at a street fair, festival or other event to answer questions, share our excitement and hand out brochures, buttons and pens. Volunteer to get out and table with us! Simply sharing why you’re involved and why you became an Owner is a great start. You don’t have to have all the answers. But here are a few — download the Chicago Market tableing FAQ with responses to some of the most-frequently asked questions we hear. To see the current list of events we have scheduled, check out the Chicago Market events page. We’ll also send emails looking for tableing volunteers from time to time — want to officially join the street team? Email Paige Worthy at PaigeW@chicagomarket.coop. Do you own a local business or know one that would be excited to join the Chicago Market community? Our posters look amazing in windows and on bulletin boards, and our brochures are bright and informative. You need collateral, we’ve got it! Contact Meg Glick at MegG@chicagomarket.coop to coordinate a pickup. There are so many event possibilities for sharing Chicago Market with the world. Nothing gets a conversation started better than friends sharing a few drinks after work! Hosting a Chicago Market Happy Hour is easy and fun. Our Ownership chair, Meg Glick, will help you get set up with a date, brochures and buttons and more. And we’ll try to make sure one of our leaders attends so they can tell people more-detailed information, and we’ll share the location in our newsletter. Everyone’s welcome, even if they aren’t yet Owners — this is a perfect way to recruit new people into our community. Contact Meg Glick at MegG@chicagomarket.coop for more details. Cooperatives are built one Owner at a time. That’s why a great way to spread the word about Chicago Market is to host a house party! If you’re interested in hosting a house party, we will help to make it as easy as possible. We can provide a kit with brochures and posters for your guests, buttons and pens to give away, tote bags for new Owners who join at the party and more. If you like, we can arrange for one our leadership team to come and speak to the group for 5-10 minutes. All you have to do is pick the date and invite your friends. Contact Meg Glick at MegG@chicagomarket.coop for more details. You read that right — we’ve partnered with our friends at Farmhouse to offer a special deal on a whole-pig roast hosted by you and Chicago Market. One of Chicago’s greenest restaurants also offers Chicago Market dinner parties at a 10 percent discount for the whole table, valid at either location. Invite your friends to dinner, then talk Chicago Market. The sky’s the limit. If you want to plan something special and link it to Chicago Market, Volunteer Owner Programs Coordinator Liat Shanan can help you make it a reality. Email her at liats@chicagomarket.coop to brainstorm and get your special event on the calendar. Our leadership team is here to answer all of your questions and help you spread the word about Chicago Market. Below is all of our contact information — don’t hesitate to get in touch! • Malcolm Haar (MalcolmH@chicagomarket.coop): website questions, IT issues, bugs, glitches, etc.